Stimela is difficult from beginning to end , wide and deep soundstage , strong audience activity in the back ground , superb macro and micro dynamics and to top it off a strong emotional performance from Masekela ..
wouldn't it be glorious though if all recordings sounded as good ? I've been living with the new room now for a couple of months, listening for a hour or two at a time as my schedule would allow. Speakers have not moved since they were setup & voiced by my Wilson rep, but I did move the gear rack about 6 inches toward the front of the room—mostly for aesthetics, but also so my power cables would reach the Shunyata conditioner. "There's such a big difference in the bass! And in the overall acoustics of the room. I'd say it's a big success." "Bob, very impressed with the outcome. Excellent soundstage, pinpoint positioning of instruments, vocalists are there in the room. You can hear the emotion in their voices. Nice bass, tuned, balanced and deep. Tonal balance is good throughout. Please don't try and tweak, just let your soul enjoy the good music you've collected." Thanks for having us over and for the excellent wine. First the room looks really great, dedicated listing room for sure. I thought the prior room was great, this is even better. Also love the wine cellar. As for sound, definitely a step or two better, except for the bass, that is a quantum leap better. Amazing how much better the bass became without losing the detail yet increasing the soundstage. Great investment and worth the time spent. I have to say it is comforting to have some folks who are true audiophiles offer positive comments. 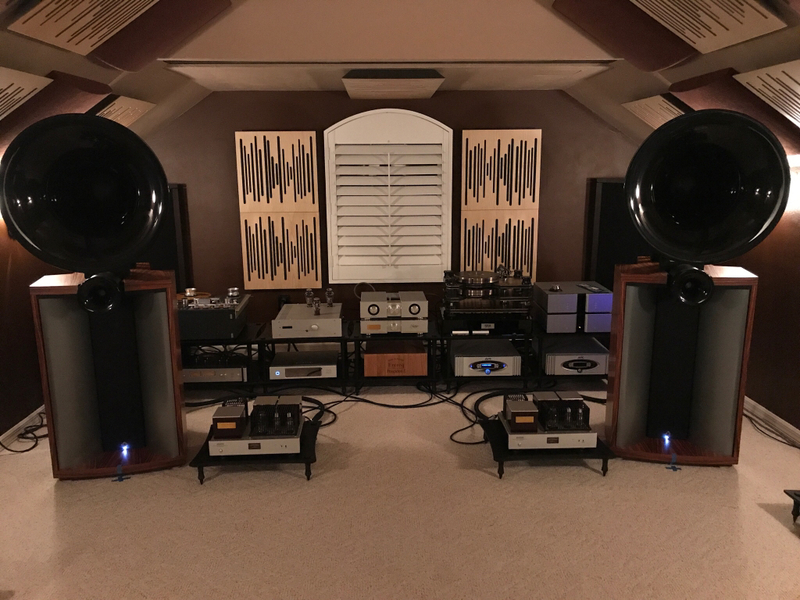 While I have been saying to my wife how much better the room sounds, there has been that nagging voice in my head that says maybe its all just expectation bias. Oh yes, also just added Shunyata Triton v3 and New AlphaNR cable (between Triton and Ref10). The triton replaced a Hydra v2, 4 or 5 generations old. A not subtle lowering of noise floor, everything comes through with a bit more presence, weight, and 'verve'. Still settling in—the new Shunyata process of pre-conditioning the unit before shipping means it is already about 90+% done. Nice upgrade! With the new room, I feel now like my systems is at least playing in the big leagues. No where near some folks level, but I'd be happy sharing some tunes with even the most seasoned audiophile. Y'all are welcome if you're in Portland, Oregon area or passing through. Been a long while since I added anything to this thread... lots of changes as reflected in my signature. But this past weekend we had a little snow and with my landscape lighting I caught a photo before the overall light shifted too dark. What a beautiful and relaxing view. Perfect for listening to music. Wow, what a great view to look at while enjoying some tunes. Thanks for sharing. Gorgeous Bob! Beautiful setting and fantastic musical instruments. Enjoy! Hard to pass on the back drop. Bob, I’m Ed, There’s a few of us up here in Seattle. Are you Portland proper? I come down to Clackamas and Vancouver.